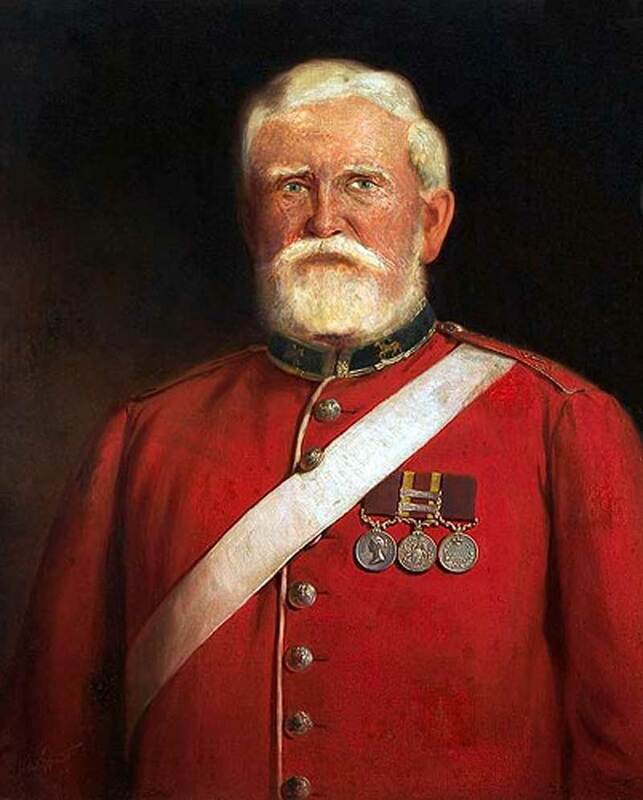 In the museum at Clandon is a portrait of a Sergeant Major Lynch. On his tunic are three medals, the Long Service and Good Conduct medal, the Meritorious Service Medal and the China medal with the two clasps "Pekin 1860" and "Taku Forts". Sergeant Major Lynch served with the Queens and later in Guildford with the Militia Battalion as a permanent staff instructor. Also in the museum are some early photographs and a water colour showing Hong Kong as it looked in 1860. Before the British flag was placed on Hong Kong island in 1841 by merchant-adventurers expelled from Canton, the island harbored only a few Chinese pirates, vagabonds, and stonecutters. The Chinese were forced to cede the island to the British in 1842 following their defeat in the First Opium War. According to one legend, the Chinese named the settlement Heung Keung, or "Fragrant Harbour", because of the scent of Indian opium that hovered in the air from the British clipper ships waiting to make their run up the Pearl river to Canton. Beginning with the Taiping rebellion in 1850, Hong Kong grew rapidly. Civil wars and economic and social changes in China drove various waves of refugees into the territory. At the end of the Second Opium War in 1860, the British forced the Chinese to cede part of the Kowloon Peninsula. In 1899 the British took a 99 year lease on the New Territories. China always considered the agreements to be "unequal treaties". During World War II, Hong Kong was occupied by Japan. Hong Kong is located on the South East coast of China, 80 miles South East of Canton, it has one of the worlds largest natural deep water harbours. The heart of the metropolis is Victoria on Hong Kong island. Today it boasts the highest population density in the world, and some of the worlds tallest buildings. Hong Kong is the shopping, eating, fashion and entertainment mecca of Asia. More feature films and videos are produced in the territory than anywhere else. Hong Kong is also one of the worlds busiest shipping centres and is continually upgrading its port and harbour facilities. A new airport and container port have been built. The 31st Regiment arrived in Hong Kong on the 23rd April 1860 and on disembarkation, encamped on the Kowloon Peninsular. The ground was damp and malarious which caused the outbreak of fever and ague in the Regiment. The 31st left Hong Kong on the 29th June 1860, later disembarking at Talienwan Bay, the area selected as a base for operations in North China. The 2nd, or Queen's Royal Regiment of Foot arrived in Hong Kong harbour between 7th and 11th May 1860 on board HMS Vulcan and HM Transport Urgent. Due to imminent operations the troops remained on board under extremely trying conditions. At the end of the war and the sacking of Pekin, the Regiment returned to Hong Kong in two detachments arriving on 30th November and 1st December 1860 and were encamped at Kowloon. The Regiment embarked for England in three detachments departing on the 15th and 19th December 1860 and the third departing on 22nd January 1861. In November 1923 the 1st Bn The East Surrey Regiment arrived in Hong Kong and departed in November 1926. During its stay the battalion was visited on several occasions, both formally and informally by Prince George (later the Duke of Kent) who was serving with the Naval Squadron visiting China Waters. He was always a popular guest and enjoyed playing the piano and accompanying anyone who cared to sing! On 23rd April 1926, a new set of silver drums bought with a legacy bequeathed by the mother of a former officer of the Regiment who died whilst serving in 1894, was dedicated by the Bishop of Hong Kong. The silver drums are still in service with The Princess of Wales's Royal Regiment today. The 1st Bn The Queen's Royal Regiment arrived in Hong Kong on 16th May 1927 and left on 22nd March 1929, occupying initially Wellington and Victoria Barracks, and later Hankow Barracks at Sham Shiu Po near Kowloon. During its stay the battalion provided anti-pirate guards on ships plying China Waters and on river boats to Canton. The battalion was relieved by 1st Bn The Somerset Light Infantry. The battalion paid a brief visit on 5th November 1930 whilst en route for Tientsin and Pekin, and similarly in 1934 at the end of its tour at Tientsin. The 2nd Bn The East Surrey Regiment sailed for Shanghai in October 1938. After a brief stay in Singapore they arrived in Shanghai in October. Here they took up duties as a garrison battalion. Guards and patrols with a standing inlying piquet were their main duties. Here the battalion saw the brutal behaviour of the Japanese to the Chinese civilians. 2 Surreys were to suffer the same barbarous treatment as POWs of the Japanese after fighting a series of battles down the length of Malaya and into Singapore a few years later. After a tour in Aden The Queen's Royal Surrey Regiment, arrived in Hong Kong to relieve 1st Bn The Northumberland Fusiliers on 3rd March 1962, and left on 30th November 1963 on relief by 1st Bn The South Wales Borderers. They were stationed at Stanley Fort. During its stay it was deployed in the New Territories on Operation 'Seal' to stop the influx of illegal immigrants from Communist China. It also gave considerable assistance to the civil population of Hong Kong after the devastation caused by Typhoon 'Wanda'.